Description: A defining characteristic of the Dandelion is the shape of the leaf. The tip is sharply pointed, the shape is long, and there are irregular, pointy lobes. The leaves sprount from the base of the plant. The Dandelion grows on lawns all over campus. The flower is open typically until mid-afternoon. Also, if you break the Dandelion's stem, the should be a white milky substance inside the hollow stem. Leaf: As said above, the leaf is long and skinny with irregular lobes and a pointed tip. The leaves grow all around the base of the stem. The lengths of the leaves are from 5-20cm (2-18 inches). 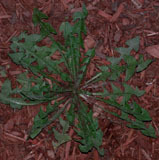 Habitat: Dandelions are weeds and grow all over lawns and along roadsides. Location: All over campus around less cared-for lawns.